Looking for the perfect dessert for your menu? 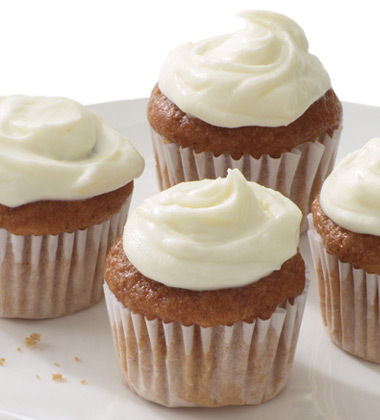 Try our Spiced Mini Cupcakes made with Campbell's® Condensed Tomato Soup. This spicy and savory treat is the perfect way to finish off any meal! all-purpose flour	 1 5/8 qt. baking soda	 2 1/2 tsp. ground cinnamon	 0 1/2 tbsp. ground cloves	 0 1/2 tsp. egg, large, beaten	 6 ea. 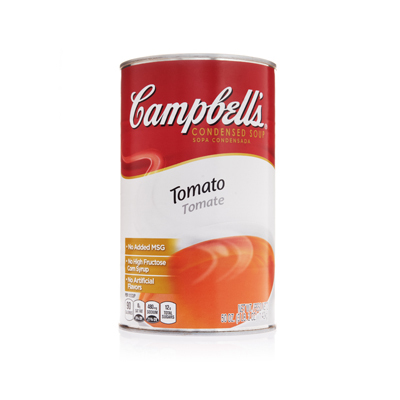 This rich, smooth soup is made with a flavorful tomato puree and delicately seasoned. 1. Mix flour, baking powder, baking soda, nutmeg, cinnamon, and cloves. Set aside. 2. Beat shortening with mixer at medium speed for 5 minutes. 3. Gradually add sugar and beat 5 minutes more or until light and fluffy. Scrape sides of bowl frequently. 4. Add eggs. Beat for 2 more minutes. 5. Add soup and flour mixture alternately, mixing until smooth. 6. Divide batter evenly between lined cupcake trays or greased and floured sheet pans (18 x 26). One pan for 50 servings. 7. Bake at 350° F for 35 minutes or until done. Cool. 8. Serve with whipped topping (2 tbsp. per individual serving).